Since The Party Wall Etc Act 1996 became law in mid -1997, England & Wales now have a procedure to follow when work has an effect on a Party Wall. For example, if the foundations of a proposed extension are deeper than your neighbour’s building, and within 3 metres of that structure, then a Notice would need to be served. All semi-detached and terraced houses have party walls, and flats have party structures i.e. floors between 2 apartments. If you are planning work that affects the party wall you must obtain your neighbour’s agreement before you commence, via a Party Wall Notice or in the form of a document called a Party Wall Award prepared by a Surveyor. 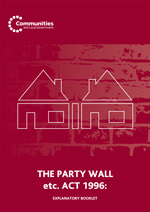 The purpose of The Party Wall Etc Act 1996 is to minimise disputes between neighbours, by making sure property owners use a Party Wall Surveyor to determine how the work is carried out. The Act also protects property owners who may be affected by the work, but at the same time prevents them from frustrating the process. This is a specialist area of property law and requires a Party Wall Surveyor to be engaged. We at Edward Jackson are fully experienced in advising clients on Party Wall matters, setting out a Building Owner’s rights and responsibilities and protecting Adjoining Owners from any potential damage that may occur to their home.